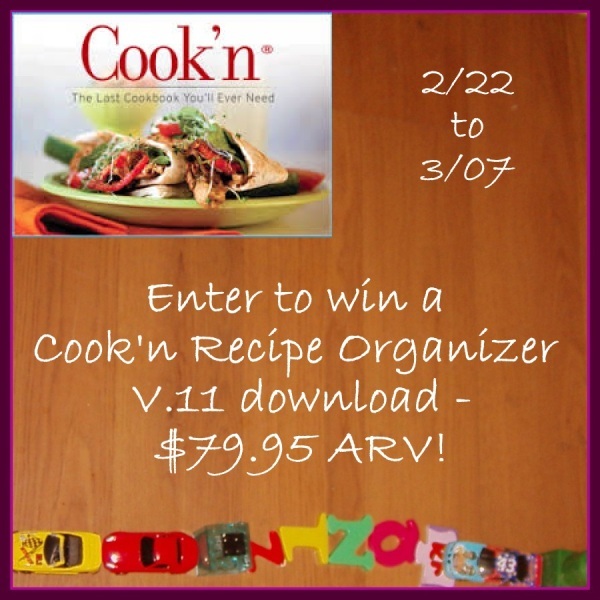 Welcome to the Cook’n Recipe Organizer v.11 Giveaway! This is an amazing piece of software that will get your recipes organized like you wouldn’t believe. The Cook’n Recipe organizer allows you to pull recipes from just about anywhere – webpages, blog posts, Pinterest, scanned recipes, word or notepad documents, even a picture of a recipe – and import it into the program for easy organization! You can also purchase any of their large selection of cookbooks to add directly into your program. But more than simply organizing your recipes, Cook’n does so much more. Have some veggies you need to get used up before they spoil? Use the search function to find recipes that call for them. You can plan out your menus days, weeks, or even MONTHS in advance – and Cook’n will generate a shopping list for you based on your menu plan. It even organizes your shopping list items by aisle and estimates how much your list is going to cost! You can also click for nutritional information on any recipe – Cook’n has nutritional facts from the labels of over 10,000 food products. You can even compare different brands to choose the best option for you and your family. The Cook’n program also comes with free companion apps for your Android, iPhone, iPad, or Kindle. Rather than have to print out a recipe (or drag your laptop into the kitchen! ), you can just view that night’s recipe on your smartphone or tablet sitting on the kitchen counter. Make sure you check out Tara’s full review of the Cook’n Recipe Organizer! One lucky reader is going to win a download of this great program to get organized in the kitchen. The giveaway will run from February 22, 2014 to March 7, 2014 at 11:59pm EST and is open to U.S. and Canadian residents ages 18 and older. The winner will be contacted by email and will have 48 hours to respond and claim his/her prize. Enter using the Giveaway Tools widget below – good luck! Incredible!! This can give you the nutritional information on ANY recipe?? This would be such a treasure for me!! I am a diabetic, so I am always reading labels and trying to calculate nutritional information. This would be such a great thing to have! !